So, the idea behind this blog is that in the lead up to Doctor Who‘s 50th anniversary in November 2013, I’ll pick one story per post. The gimmick is that I’ll pick a story from each of those 50 years – the only criteria being that the story has to have been first broadcast (or published) in the year in question. And so we begin in 1963. But not at the very beginning. I love An Unearthly Child – yes, even the cavemen episodes – but it’s inevitably overshadowed by this, the first Dalek story. This is where it all really began – after four weeks of running round at the dawn of humankind, Terry Nation shows us how it might all end. How, in 1963, after the Cuban Missile Crisis, most people probably thought it would end, and probably quite soon. A dead planet soaked in radiation. Its cities intact but deserted – like the petrified trees and the fossilised monster in the jungle, a cruel mockery of life. The first episode is eerie in a way Doctor Who rarely can be now that it can’t spend 25 minutes purely following the regular cast. And it sells the idea that this is a desolate place, that the TARDIS crew are lonely wanderers, adrift in a vast, empty universe. It’s the kind of juxtaposition of the smallness of humanity and the vastness of the cosmos that Robert Holmes riffs on in The Ark in Space, with Sarah Jane listening to the sepulchral tones of the Earth president as she joins the rest of humankind in their space mausoleum. And later, Russell T Davies emulates in his first two episodes where the Doctor talks about feeling the turn of the Earth, and Rose witnesses its final end. Of course, it might not have turned out this way. It’s probably fruitless to speculate at this late date how much of “Serial B” was suggested by the production office, because the sets and cast of The Dead Planet could almost serve as the introduction to Anthony Coburn’s The Masters of Luxor. Now we’re able to listen to a version of it thanks to Big Finish and can see the similarities in the premise – a beautiful but dead planet; a huge, seemingly deserted space city made of metal; the TARDIS drained of power and unable to take off; a first episode only featuring the four lead actors, and a race of robots with a pathological dislike of their humanoid neighbours. I wonder whether story editor David Whitaker pitched the concept to both Coburn and Nation, knowing what was affordable, what the BBC effects department could handle, and the kind of story he wanted to see – and then sat back to see what the writers made of this starting point. And then we meet the Daleks themselves. Everything about them suggests a production team that’s trying and succeeding at being iconic. The voices, the extermination effect, the immediately recognisable silhouette complete with all its unfathomable details of bumps and slats and plunger. All these have stood the test of time – even the derided iDaleks of the Matt Smith era hew pretty closely to the original template. Christopher Barry directs them beautifully, with low shots and sympathetic lighting, and Terry Nation includes the grisly detail that the real Dalek is too hideous to show (and going by Ian’s reaction to an image of them, their ancestor Dals weren’t much to look at either). They’re so successful they set the template for pretty much every Doctor Who monster that follows. 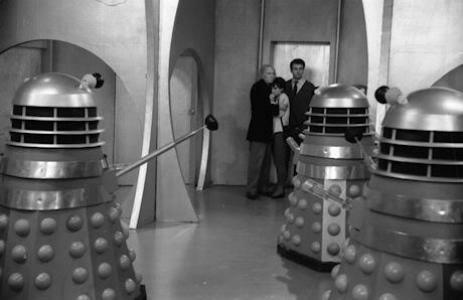 But more than that: even in their first appearance, the Daleks are already the Doctor’s ultimate enemy. Ian suggests their hatred of the Thals is a simple dislike of the unlike, a fear of anything that isn’t Dalek. The Cybermen want to convert you. The Master wants to rule over you. The Daleks want to exterminate you. Even though he’s at his least heroic for much of this story, the Doctor is expressly set up as an explorer, whose insatiable curiosity – his greed for knowledge, if you like – is his downfall. He wants to see the universe, to experience it. The Daleks want to destroy it. No wonder they hate each other. In the next entry, we’ll see that the Daleks come to define the Doctor, making him a great hero by the sheer depth of their villainy. Time and again, they return when the Doctor is at risk of losing himself – and he rises to meet them. And even here, with none of that weight of back-story or audience expectation, something similar happens: the Doctor, at risk of becoming an anti-hero thanks to his selfish actions earlier in the story, chooses to side with the Thals to defeat the Daleks, when he could instead have sold them out to retrieve his fluid link. The Time War – a battle between Time Lords (two of them, anyway) and Daleks for the sake of all creation – begins here. And 50 years later, it still goes on. Next Time: The Doctor, Susan, Ian and Barbara land 200 years in the future. They’re back on Earth. But the Daleks are waiting at World’s End.